News / Giulio Barbieri S.r.l. launches the "Made in Ferrara"
Ferrara, 31st May 2018: "Made in Italy" gives way to "Made in Ferrara". 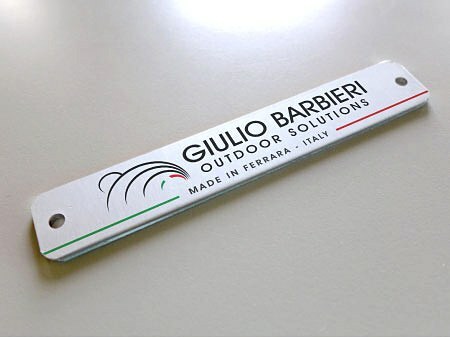 After the recent logo change (in February), Giulio Barbieri S.r.l., a company based in Poggio Renatico, one of the leading national and international companies in the field of manufacturing and supply of outdoor structures, is promoting a new important change in the corporate field, which is of great importance to the surrounding community. Starting from today, every product of the company will be fitted with a new riveted aluminium plate which bears the product's place of manufacture: no longer the "generic" Italy, but Ferrara. The decision to replace the traditional "Made in Italy" phrase with "Made in Ferrara - Italy" has a double value: first of all, it aims to be a clear sign of trust in the community which it is a part of; secondly, by stating the specific location where Giulio Barbieri S.r.l. products are made, the company wants to show, with the utmost transparency towards its customers, the authenticity and quality of these products. "We are proud to take this path,” says the president of the namesake company, Giulio Barbieri, “indicating "Ferrara" as a specific geolocation of the production of our structures is a source of pride for me, because many of them will be installed in locations of great renown in different parts of the world (such as royal residences on the occasion of major events and ceremonies, world-famous sports facilities, Olympic venues or the highest professional football and motorsports competitions and, generally speaking, major events of international appeal). As an entrepreneur, by making this choice, I would like to support the territorial and industrial development of our province, and to announce that Ferrara has everything needed to support and enhance the growth of companies and enterprises that decide to settle here. More and more frequently, during my travels abroad, I realise that affirming the "Italian" authenticity of our products is no longer enough. We need more honesty and transparency, hence the idea of speaking clearly and writing “Made in Ferrara” – the place where our company headquarters and our production plant are located - directly on our products".